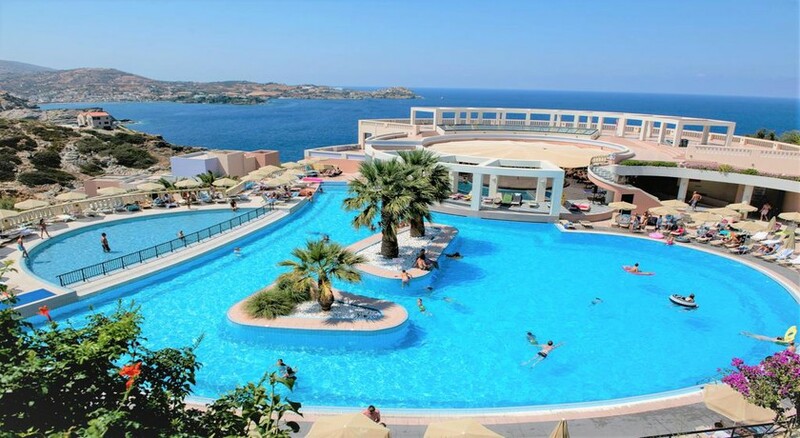 Located on a hilltop with picture-perfect views of the ocean, Athina Palace in Heraklion is a perfect spot for peaceful beach holidays. This stunning 5-star property boasts 355 beautifully decorated rooms, each designed to cater to your needs and wants – including a spacious terrace with panoramic views of the hills and ocean. 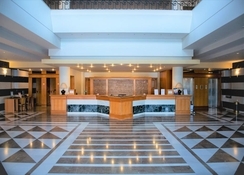 The hotel features a variety of excellent restaurants and bars that serve local and international cuisines, including an la carte restaurant, Greek taverna, main theme restaurant and snack bar. There are three outdoor pools to enjoy plus an indoor heated one, alongside a relaxing jacuzzi, spa center, mini market, jewellery shop and much more to indulge in during your stay. With all-inclusive, half board and bed & breakfast accommodations, the hotel is an ideal destination for a relaxing holiday with friends, family or a loved one. The hotel boasts total 355 guestrooms perfectly decorated in vibrant colours, opening out on a balcony/terrace overlooking the gorgeous Med. The rooms are divided into double rooms with land/sea view, family rooms and suites with all the basic amenities like air conditioning, mini refrigerator, satellite television, in-room safe box, telephone, hairdryer, coffee machine and more. Suites vary in terms of number of bedrooms and can accommodate up to six guests. You have free access to the internet in all rooms, but services such as laundry and babysitting come at an extra cost. The hotel boasts some amazing restaurants and bars. 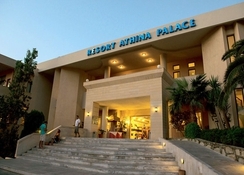 Its main restaurant, Zeus, serves breakfast and dinner buffet style with rich Mediterranean dishes and a cooking show. The hotel’s another restaurant, Hera, is an a la carte menu that hosts themed nights, where you can relish the fresh catch of the day like lobster or fish. Ermis is the popular snack bar serving pizza, salads, grilled meat and more for a buffet-style lunch along with your choice of drink. There are also three more bars that offer beverages. The hotel features 3 large outdoor swimming pools, and an indoor heated pool perfect for an evening swim. There are a few outdoor games available within the property including table tennis, darts, tennis, volleyball, etc. For your kids, there is an array of programs and activities planned everyday, including karaoke, dancing and cabaret, kids club, a beachfront playground, spa and fitness centre, and much more. Enjoy sunbathing on the loungers arranged along the pebbled beach. For watersport enthusiasts, there’s a special arrangement for diving and snorkelling that can be enjoyed on the beach.